There were just 8 Senior men from the Fylde competing in the English Cross Country Relays in Mansfield on Saturday and only 4 teams from 2 clubs west of Blackburn and no senior women, which has made the action quiet for this week. On other fronts, the British & Irish Masters International is set to be staged in Southport next November (this year’s event is next weekend in Swansea), and plans are well ahead to stage the next round of the European Masters Non-Stadia Championships in London, with most of the action set to take place in Regent’s Park. Carmel Sullivan was the only Wesham runner at the popular Through the Villages race on Sunday morning from the Dressers arms at Wheelton. She finished 10th woman and 1st W50 for the 8.4-mile hilly route out through Brinscall and Abbey Village clocking 1:04:31 coming in 99th place overall. The autumnal conditions were stunning on the northern flanks of the Anglesarke moors despite the rain and clagged-in weather. Rossendale Harriers dominated the Brownhouse Wham Race at Whitworth on Sunday but could not throw Kath Hoyer off course as she completed the 5km course in 26:51 10th woman and 2nd W55 in 29th place overall. Dave Waywell finished 2nd M70 in 30:27 in 50th place. Lee and Tanya Barlow ran the Run Tatton 10k on Saturday in Tatton Park near Knutsford. Lee finished 17th in 38:26 to take 2nd M45. Tanya was 121st woman and 19th W45 in 57:04, 415th overall. There were 1024 runners in all. Wesham had three runners in the very scenic Derwentwater 10 race on Sunday around the lake south of Keswick. Peter Cruse finished 4th M55 in 1:10:44 over the hilly country course, placing 70th overall. Helen Lawrenson was 26th woman and 5th W45 in 1:19:50, placing 158th overall. Evergreen John Howorth returned to action after some time to finish 356th and 10th M65 in 1:39:57. The Lancaster Castle Trail Half Marathon took place on Sunday and Paul Gregory finished 9th in an excellent 1:26:25 for 2nd M40 place. Neil Gregson ran a blinder to take 8 minutes off his personal best on an off-road course, coming in 23rd with 1:32:08. David Taylor ran the 5th fastest time of the day at the Lytham Hall parkrun on Saturday morning, recording 18:56 for an age graded performance of 68.66%. Ian Garrod ran 19:56 for an M55 grade of 77.76% and a new personal best performance. Jonathan Lawson had an M50 67.73% with his time of 21:57, and Stuart Topping clocked 23:36 for M45 61.92%. Stephen Twist ran 23:38 for M45 63.40% and Paul Eccles 24:55 with an M35 grade 53.98%. Tanya Shaw ran 27:02 for W40 57.34%, with Jo McCaffery 28:01 for W40 54.91%. Phil Leaver had to back off the pace with breathing difficulties to run 29:00 with M65 57.82%. James Birchall recorded 29:23 for a new personal best time with his age grade of 43.96%, with Julie Rooney running 29:42 for W40 52.97%. Sally Deacon had a W50 grade of 55.94 with her time 30:43. Tracey Hulme ran the South Manchester parkrun in Platt Fields with 23:08 for her debut run with W55 77.23%. In the Preston parkrun Nigel Shepherd ran 22:09 for an M60 grade 72.39%, with Steve Myerscough getting back with 22:21 and M45 63.46 in his new age category. Robert Brown clocked 25:42 with M60 62.97% and Elizabeth Johnson ran 26:09 for W35 58.13%. Chris Pike ran St Helens Victoria Park with 27:53 for M40 50.09% and Martin Bates was in Bolton’s Leverhulme Park for 25:56 and M60 62.92%. James Mulvany was out at the Abingdon parkrun, clocking the 3rd fastest time of the day with 17:14 for an M40 age grade of 79.21%, also a personal best for the course. 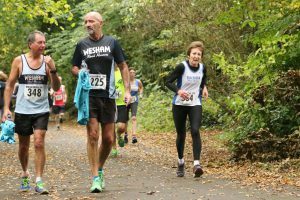 In Blackpool’s Stanley Park run Rob Wallace was first Wesham finisher in 22:08 with 58.28%. Dave Marsland ran 24:29 for M60 66.64% and Suzanne Leonard 24:36 for W45 66.53% chased in by George Kennedy 24:46 for M60 65.34%. Dave Young ran 26:40 for an M70 grade of 66.94% and a lean Finlay McCalman clocked 26:56 for M50 56.56%. Andrew Moore ran 27:25 for M55 56.53% and Graham Cunliffe returned 28:47 with a recurrent calf problem for M60 56.69%. Along the Fleetwood Promenade Brian Jones ran 31:14 for M55 50.05%, and further afield at the Myrtle parkrun in Bingley home of the Bingley Music Festival the Wesham parkrun tourists ran as a group, with Megan Gore recording 37:09 for JW11 44.77% with Steven Gore also 37:09 and Vicky Gore running 37:08.